POLYCLINICS have been in the news recently, and Solihull Care Trust is currently 'consulting', not on whether we want a polyclinic in the first place, but on what services we want it to provide. that this could damage the viability of her own GP surgery, that private funding could be used and that mention of 'a pharmacy nearby' could help put small local pharmacies out of business. 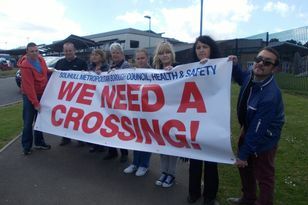 Who has decided that Solihull should have a polyclinic? Not us, that's for sure. The BMA, among others, have criticised the government for trying to force a 'london-centric' model on the rest of us and undermining the role of the family doctor. While centralisation of services may be a good solution for inner cities, why does a 'one size fits all' solution have to be imposed on the rest of us? I value my personal relationship with my own doctor, and many people will be less able to travel further to access primary healthcare needs. to confirm this is the case, and why no meaningful consultation has taken place in Solihull. And locally I've asked for an emergency meeting with Sally Burton, Chief Exec of the Care Trust, to find out who took it upon themselves to make this decision for us and what it will mean for the future of GP surgeries in Solihull.